Monster Bash magazine #35 - Facts of Dracula - Zombies or Ghouls? 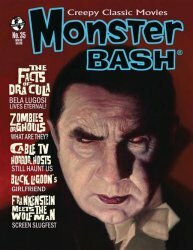 MyMovieMonsters.com > Monster Magazine Marketplace > Monster Bash > Monster Bash magazine #35 - Facts of Dracula - Zombies or Ghouls? Creepy Classic Movies presents MONSTER BASH magazine #35, Winter 2019. Artist Daniel Horne depicts Bela Lugosi as Dracula on the cover.